Like others in the genus it's quite easily bred in aquaria - image shows a fry at 12 mm TL. Close-up of 12 mm F1 specimen. This F1 juvenile measures 15 mm TL and is starting to exhibit changes in body patterning. Slightly older F1 specimen measuring 17 mm TL. Close-up of 17 mm F1 specimen. At 20 mm TL the striped patterning is more broken and the body begins to become more laterally compressed. 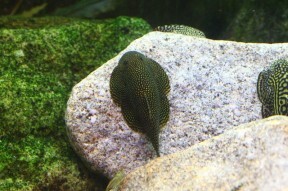 Adult specimen with fry in a typical breeding set-up. This 'species' is arguably among the most attractive in the family Balitoridae. Sewellia spp. enjoy grazing rocky surfaces with algal growth. The full extent of its range is unconfirmed but it appears native to central Vietnam where it’s been recorded at several localities in Quang Nam province. Restricted to shallow, fast-flowing, highly-oxygenated headwaters and tributaries characterised by stretches of riffles and runs broken up by pools or cascades in some cases. Substrates are normally composed of bedrock, sand and gravel with jumbles of boulders, and while riparian vegetation is often well-developed aquatic plants are typically absent. 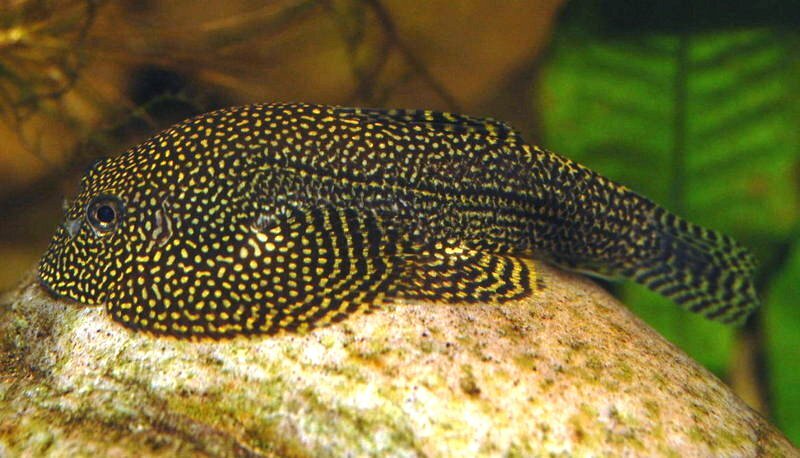 Other loaches native to Vietnam and occurring in similar habitats include various Annamia, Balitora, Homaloptera, and other Sewellia spp. Minimum base dimensions of 90 ∗ 30 cm are recommended. Smaller tanks can be used for breeding. The water must be clean, well-oxygenated, and ideally turn over 15-20 times per hour so we suggest the use of an over-sized filter as a minimum requirement plus additional powerheads, airstones, etc., as necessary. Although rarely a feature of the natural habitat aquatic plants can be used with adaptable genera such as Microsorum, Crinum and Anubias spp. likely to fare best. The latter are particularly useful as their leaves tend to attract algal growth and provide additional cover. 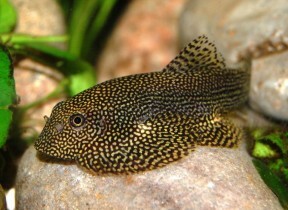 Temperature: Can tolerate higher temperatures provided its oxygen requirements are maintained but for general aquarium care a value of 20 – 24 °C is recommended. Much of the natural diet is composed of benthic algae plus associated micro-organisms although insect larvae are probably taken on an opportunistic basis. Such a ‘nursery‘ doesn’t have to be very large, requires only strong lighting and in warmer climates can be kept outdoors. Algal type is also important with diatoms and softer, green varieties preferred to tougher types such as rhodophytic ‘black brush’ algae. In terms of behaviour Sewellia spp. 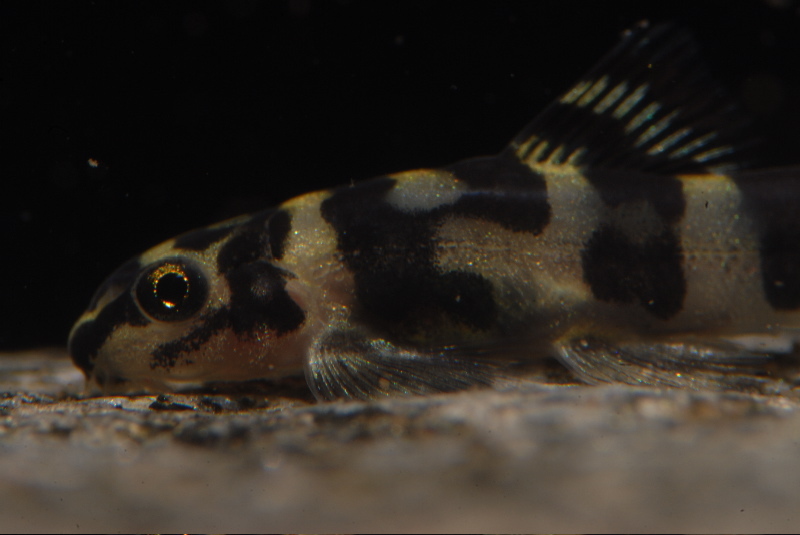 are perhaps the most dominant of the ‘sucker belly’ group of loaches though they’re not generally aggressive towards dissimilar-looking fishes. 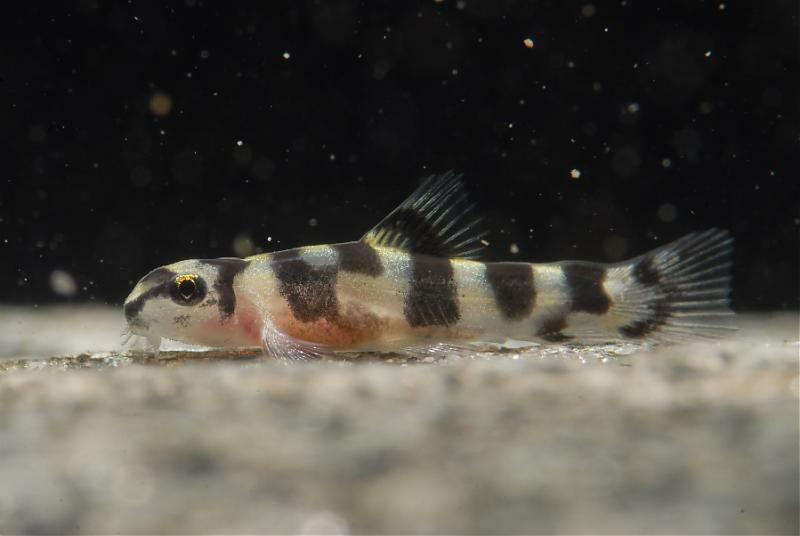 Potential tankmates include small, pelagic cyprinids such as Tanichthys, Danio, Devario, and Rasbora, stream-dwelling gobies from the genera Rhinogobius, Sicyopterus, and Stiphodon, plus rheophilic catfishes like Glyptothorax, Akysis and Hara spp. Similarly-shaped, less bold gastromyzontids such as Gastromyzon or Hypergastromyzon spp. tend not to compete well for food and territory, however, and if the latter resources are limited even members of relatively robust genera such as Pseudogastromyzon may struggle to impose themselves. Other benthic species may also be outcompeted, especially those inhabiting similar parts of the tank like Annamia, Formosania, Homaloptera, Liniparhomaloptera and Vanmanenia. Such combinations are best attempted only in larger, well-structured aquaria where space is not an issue. Under natural conditions Sewellia spp. tend to occur in quite large aggregations so buy a group of 6 or more if you want to see their most interesting, natural behaviour. They’re territorial to an extent with some individuals more protective of their space than others (often a prime feeding spot). This appears related to gender with males normally dominant. 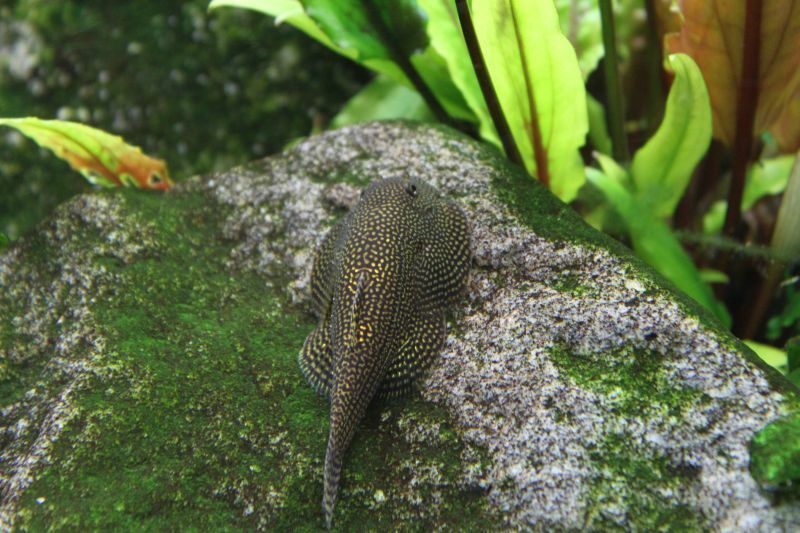 Dominance battles are entertaining to watch and often take place in a belly-to-belly stance with both fish raising their bodies from the substrate in a near-upright position. The purchase of several fish will also reduce the likelihood of a particular subdominant individual(s) being singled out, and make the group less nervous of activity outside the tank. The most obvious external characteristics are the shape of the head and body when viewed from above, with females having a comparatively broad body and a snout running almost continuous with the pectoral fins. 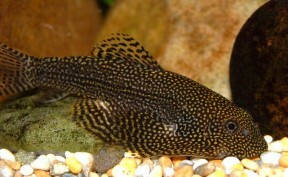 Males are slighter and the snout is much squarer in shape with the pectoral fins emerging from the body almost at right-angles. Sexually mature males also develop rows of soft, raised tubercules on the anterior portion of the first 5-6 pectoral-fin rays which have been referred to as ‘fences’ by hobbyists, plus additional rows on the dorsal surface of the head. Sewellia spp. 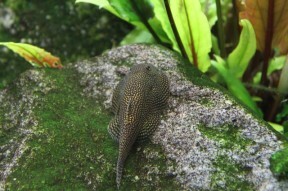 are arguably the easiest of all loach species to breed in aquaria and success has been achieved with several species. 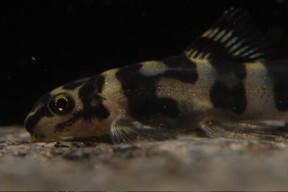 Initial reports mostly described recovering fry that had been sucked into external canister filters in hill stream-style arrangements such as that described above (see ‘Maintenance’), or discovery of small numbers surviving in mature community set-ups. 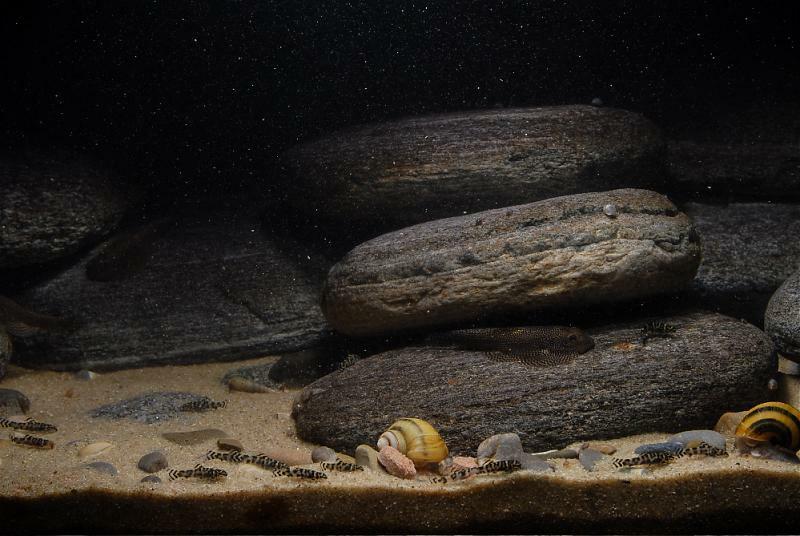 However subsequent experiments have shown that they can be bred in numbers in very simple quarters using groups of adult fish. Perhaps the most important aspect in a controlled breeding attempt is provision of a suitable, mature substrate. A large grade of rounded river gravel is best as the many nooks and crannies created allow eggs to develop within without being eaten by the adults and provides refuge for the fry until large enough to escape predation. The organic detritus that tends to collect in this type of substrate also provides a food source for micro-organisms which in turn are eaten by fry. Other décor can consist of some smooth, algae-covered rocks for the adults plus an air-powered, sponge-type filter to provide oxygenation and an additional grazing surface. This type of filter has an added advantage in that eggs and fry won’t be drawn into it. Spawning can apparently be triggered by raising the temperature to 77-78.8°F/25-26° for a period before conducting a cool water change although in many cases simply performing the latter has proven enough. Courtship is initiated by the male and involves fluttering displays and chasing of the female. When a female appears receptive the behaviour of the male changes to include circling of his potential partner, mouthing of the dorsal surface and pushing of his head into her body, seemingly in an attempt to dislodge her into open water. The act itself involves the pair rising into the water column with pectoral fins entwined before eggs and milt are released directly into the water flow, usually where the current is strongest. Presumably this is an effective means of downstream dispersal in nature, allowing the fry to develop in quieter waters before migrating upstream to join the adults once approaching maturity. In one experiment an adult pair of S. lineolata was provided with an open bowl filled with gravel and woollen mops within which the fish spawned suggesting that in nature spawning may be an opportunistic affair dependent on environmental conditions to an extent. The incubation period for Sewellia eggs appears to be undocumented but once fry are spotted it’s important to provide suitably-sized food items. Infusoria is a good initial diet followed by Artemia nauplii, microworm, etc., once they’re visibly foraging above the substrate. 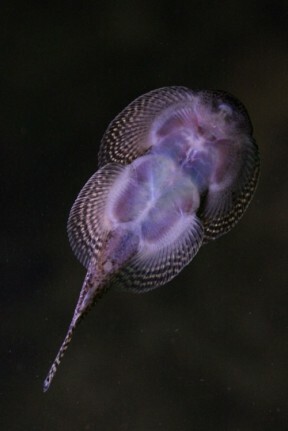 The body shape of the fry is less laterally-compressed than in adults and they initially possess small barbels which reduce progressively as they mature. The pectoral and pelvic fins are also relatively short to begin with meaning the young are unable to cling to surfaces in the same way as adults, instead spending all their time on or within the substrate. The adults seem not to predate on the fry once they’re around 5 mm or so in length and they can be left together should you wish. In community aquaria filtered by external units care should be taken when performing filter maintenance as fry can often be found inside. This is one of the more readily-available members of the genus and popularly referred to as S. sp. ‘spotted’ or S. sp. ‘special’. It’s superficially similar in appearance to S. albisuera but in that species body patterning consists of a network of irregular dark lines forming a complicated series of reticulations vs. many small, light spots on a dark background in S. sp. ‘SEW01’. It’s been suggested that these two may represent the same species but this does not appear to be the case. When describing S. albisuera Freyhof (2003) used a series of specimens collected in 2000 plus some larger, spotted fish which had been collected in 1999 and preserved in New York. Although he noticed differences in dorsal patterning between the two series these weren’t considered sufficient to separate them as distinct taxa based on the number of specimens available (J. Freyhof, pers. comm.). Later, in 2005, Nguyen and Nguyen described three species in their new genus Parasewellia, all native to Thu Bon drainage, i.e., the same river system as S. albisuera. However it appears that Parasewellia should be regarded as synonymous with Sewellia, with one of the new species representing a resdescription of S. albisuera and another corresponding to S. sp. ‘SEW01’ (J. Freyhof, pers. comm.). Unfortunately images of the type specimens for all three Parasewellia spp. are of quite poor quality, plus the descriptions are in Vietnamese, meaning that to date no-one has been able to confirm the corresponding Sewellia sp., and the situation is likely to remain this way until a revision using fresh material is conducted. Prior to the mid-1990s S. lineolata was the only species in the genus but an upturn in surveys of freshwater fauna in Vietnam and Laos has resulted in the discovery of various new taxa, several of which remain undescribed. The first addition was S. marmorata (Serov, 1996) and this was followed by the description of a further four species in Roberts’ 1998 revision. He considered the larger-growing representatives with relatively short pelvic fins (S. elongata and S. diardi) to belong to his new subgenus Diardichthys. Freyhof and Serov (2000) found S. marmorata and S. patella to exhibit a combination of characters applicable to both subgenera, however, thus Diardichthys is currently considered a synonym of Sewellia. The genus is diagnosed by the following combination of characters as per Freyhof and Serov (2000): depressed head and body and compressed tail; greatest body depth at dorsal-fin origin; greatest body width at end of pectoral-fin base; entire ventral surface of paired fins, head and body forming an adhesive disc extending to end of pelvic fin; one simple and 19-26 branched pectoral-fin rays, one simple and 18-21 branched pelvic-fin rays; pectoral fin extending beyond pelvic-fin origin; last two pelvic-fin rays not exposed ventrally, but reflexed dorsally and adpressed to side of body, forming a pelvic valve together with a thick fleshy flap on posterior part of pelvic-fin base (where pelvic fin attaches to side of body); gill opening smaller than eye diameter, covered by a vertically oblique, biconvex membranous flap; gill opening entirely above pectoral-fin base; mouth very small, strongly curved; rostral cap continuous with upper lip; upper jaw overhanging lower jaw; two pairs of short rostral barbels and one pair of maxillary barbels; rostral barbels with medially expanded papilliferous bases, partly adjacent or overlying to cavities of ventral surface of head; these cavities not connected to each other; bases of two anterior barbels fused; rostral barbels connected laterally with a small skin-fold to head; maxillary barbel short and filamentous, with a few small papillae. Sewellia spp. have specialised morphology adapted to life in fast-flowing water; the paired fins are orientated horizontally, head and body flattened and the last two pelvic-fin rays combine with a fleshy flap on the base of the fin to form a ‘pelvic valve’. Cuvier, G. and A. Valenciennes, 1846 - Bertrand, Paris: i-xix + 2 pp. + 1-505 + 2 pp. Histoire naturelle des poissons Tome dix-huitième. 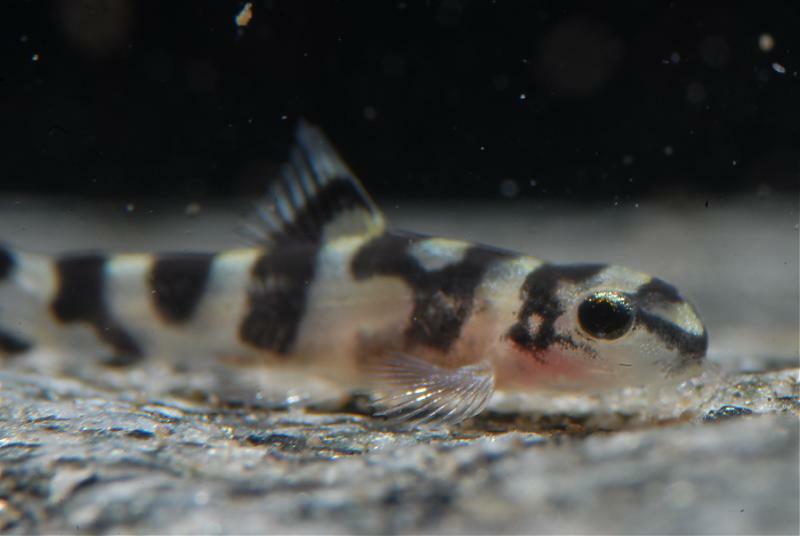 Sewellia albisuera, a new balitorid loach from Central Vietnam (Cypriniformes: Balitoridae). Review of the genus Sewellia with description of two new species from Vietnam (Cypriniformes: Balitoridae). Rediscovery of Sewellia lineolata in Annam, Viet Nam (Teleostei: Balitoridae). Indochinese nemacheilines. 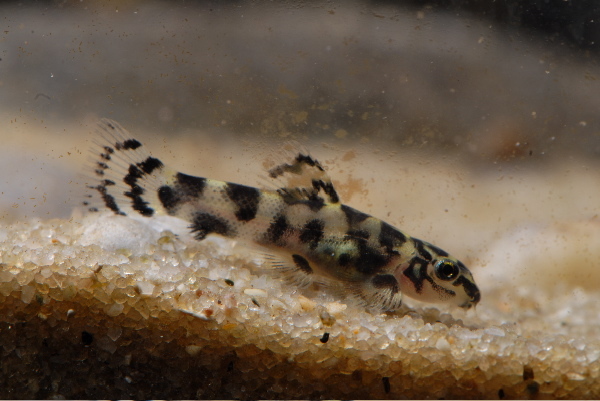 A revision of nemacheiline loaches (Pisces: Cypriniformes) of Thailand, Burma, Laos, Cambodia and southern Vietnam. Flossensauger der Gattung Sewellia Teil II - gezielte Nachzucht von Sewellia lineloata. 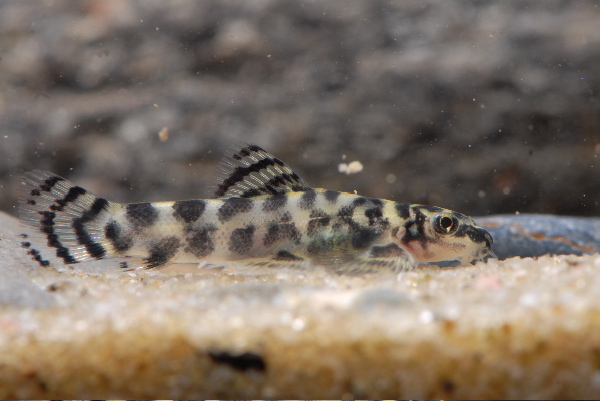 Systematic revision of the balitorid loach genus Sewellia of Vietnam and Laos, with diagnoses of four new species. Gebirgsvietnam: Natur, Menschen und Fische. Flossensauger der Gattung Sewellia Teil I - Haltung und extensive Vermehrung.